Professional Development Awards (PDAs) extend or broaden professional or vocational skills and are linked to National Occupational Standards. The PDA in Acute and Community Care at SCQF level 8 is designed to provide a specialist and robust qualification in acute and community care. This award will equip learners with the range of knowledge, specialist skills, and values to enable them to improve professional practice and patient care and to promote continuous professional development. 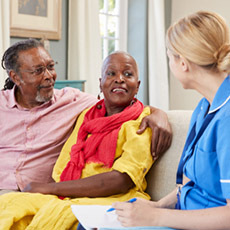 This qualification covers areas such as Leadership, Team working and Accountability in Care, and Policy, Legislation and Standards in Community Care. Learners will also be taught Evidence Based Practice, and Research and Innovation in Care. Options include Care of the Acutely Ill Adult, Pharmacology, and Disease Processes and Pain Management. The PDA in Acute and Community Care at SCQF level 8 has been developed in partnership with employers and industry, so it is suitable for the current sector. This qualification has been designed for those already in employment in a health care community or acute care setting. The PDA is set at SCQF level 8 and therefore some prior relevant qualification at level 7 is recommended. The optimum route into this programme would be the HNC in Care and Administrative Practice, although other qualifications may be appropriate, such as SVQ level 3. Entry to this qualification is, however, at the discretion of the centre. The preceding information on prior knowledge, skills, experience or qualifications that provide suitable preparation for this qualification has been provided by the Qualification Design Team as guidance only. This qualification is not designed to articulate with a particular degree programme. Centres with devolved authority for approval of HNC Care and Administrative Practice should use their own internal approval process. Centres without approval for HNC Care and Administrative Practice require to come forward for approval and should contact SQA’s Business Development Team for guidance. The approach to delivery and assessment in this new qualification is varied in order to give the candidates and centres a variety of teaching, learning and assessment approaches, and a wide range and combination of teaching, learning and assessment methods may be used by centres. The PDA in Acute and Community Care at SCQF level 8 consists of 2 mandatory units and 10 optional units.